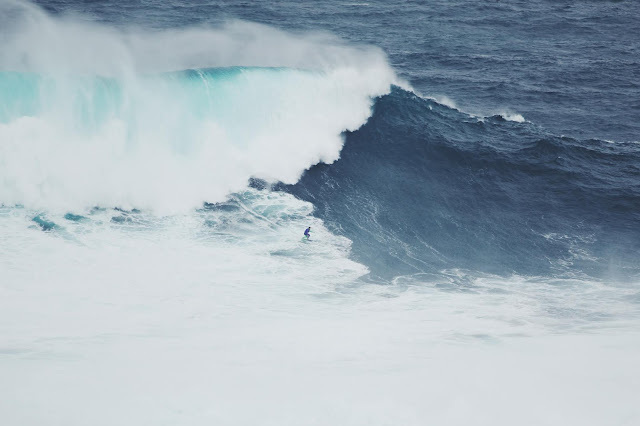 But since then, Nazaré, more specifically North Beach (Praia do Norte), have stayed on the map of the giant waves, becoming perhaps one of the most famous spots by giant wave surfers, known as the ultimate challenge of the sport, and on 8 In November 2018, Brazilian Rodrigo Koxa achieved what was deemed impossible and dethroned the McNamara record by being able to surf a 24.38 meter wave and reach a new Guinness record. Something that is strange is that these fantastic waves were unknown to a large majority of Portuguese, even people who, like us, always had as one of the main holiday destinations the beautiful beach of São Martinho do Porto, less thkm20 kms from Nazaré and, we always had the habit of walking and making wonderful meals of fresh fish in Nazaré. However, this area has always been much feared by local fishermen and it is said that even a WWII submarine is wrecked in these waters, completely impossible to reach. For the truth is that it had to be someone from outside the country to make known to Portugal and to the world this precious treasure that exists in North Beach (Praia do Norte), nothing less than the Nazaré Canyon, capable of producing one of the greatest spectacles which you can see in the world. And the truth is that, really, this is one of the biggest and most amazing shows you can ever get a chance to see. You can even say that you can see giant waves in various parts of the world, which is really true but here nature joins one of the biggest and most spectacular waves in the world with a stage that seems perfect to watch this spectacle of nature. The reason is that this spectacle takes place right next to the Fort of St. Michael the Archangel (Forte de São Miguel Arcanjo) and the Lighthouse, just near the coast in which, from its height, you will be even more frightened by the proximity of waves with more than 20 meters, and that will make you feel the taste of the salt coming to your face. It's the perfect spectacle added with the perfect showroom to watch it, what more can you ask for? HOW DOES THE NAZARÉ CANYON FORM? It is not easy to know 100% the reasons that explain the existence of these giant waves. One of the essential ingredients is the existence of a gigantic hole under the sea, which reaches most a depth of more than 5000 meters and has a length of 227 km. But not only these special conditions depend on the creation of the magnificent giant waves, but other factors, such as the tide, must also be combined with the existence of storms in the North Atlantic, which occur more frequently in autumn and winter. increase the size of the waves that reach the cannon. To this, it is necessary that there is not much wind, the weaker the better, and that the direction of the wave coming from the ocean is indicated, namely that it comes from W / NW. When this set of conditions is verified, then prepare yourself as it is the ideal time to indulge in this unique spectacle in the world. But, rather than explaining ourselves, we invite you to watch this video of the Hydrographic Institute of the Navy of Portugal that, although it is in Portuguese, can add the subtitles in English and have a great explanation of this natural phenomenon extraordinarily. 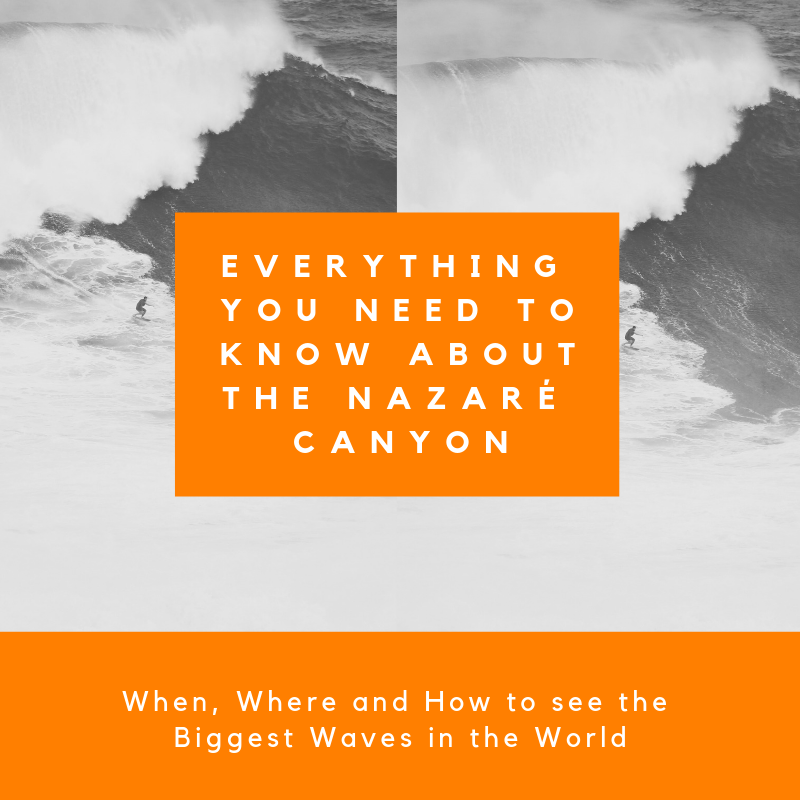 WHEN TO SEE THE NAZARÉ CANYON? Well, as we have said, it is necessary that a set of conditions come together for this spectacle to occur. As we have mentioned, it is easier to do this in the fall/winter period, but by itself, does not mean that if you go to Nazareth during these months of the year, you will be able to see the Nazareth Canyon. In fact, the first time we saw this wonderful sight, we had gone to the beach the day before and the sea was calm, with a perfectly normal ripple. 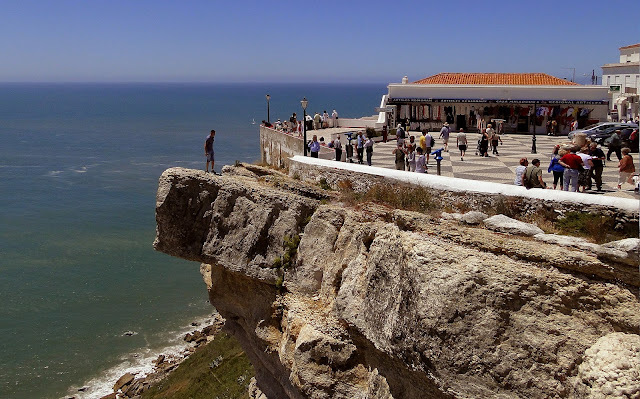 However, Nazaré has several other attractions and one of them is the gastronomy and when we were having lunch we commented with the restaurant employee that we had not been fortunate enough to see the famous Nazaré Canyon, and he told us that tomorrow would be a great day for that. The truth is that this seemed impossible to us, for on that day the sea was calm, and to imagine that it would turn out like that in less than 24 hours, seemed not to be true. But was. The point is that the sea and atmospheric conditions change very quickly and this produces the difference between watching a beautiful but relatively calm sea or watching a spectacle that will amaze you and feel tiny before the sea. One question we can always say is that you do not come to Nazareth just to see the giant waves. Nazaré itself is a special area of Portugal, with a lot of tradition, beautiful beaches and, a few kilometers away you can enjoy other wonderful places, such as the magnificent beaches of the West, a paradise yet to be discovered by many others, which are a treasure for Portugal. It also has the beautiful and historic cities of Alcobaça, Caldas da Rainha and Óbidos, among other attractions. In short, you have a lot to know and explore in this area but, if you want to be sure you want to see the giant waves, you should always book a vacation in Portugal for 2, 3 weeks between October and February, the best months of the year to see the fantastic waves. 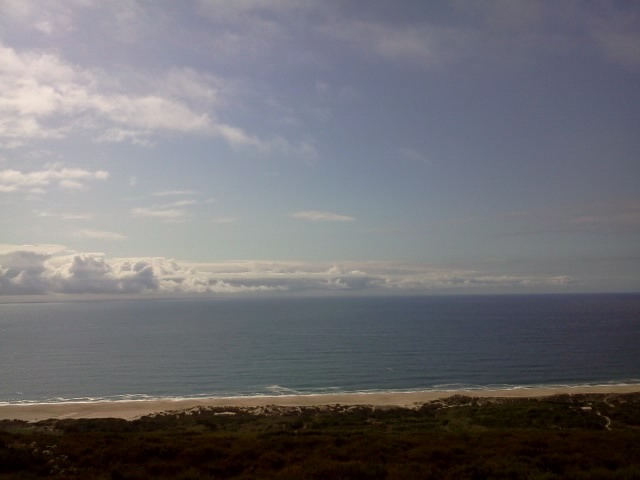 Do not worry, you do not necessarily have to stay in Nazaré these 2 weeks. Know that if you are walking around Lisbon and know that the next day you can watch this huge show, you can arrive there in less than 1h30 by car, as the distance from the Portuguese capital is about 120 kms, easily achievable by car. Even so, we still have not answered the real question, that is, how to know when the giant waves will occur in the Nazaré Canyon. Unfortunately, it is never possible to know far in advance and, the closer to the day, the greater the certainty of occurrence. 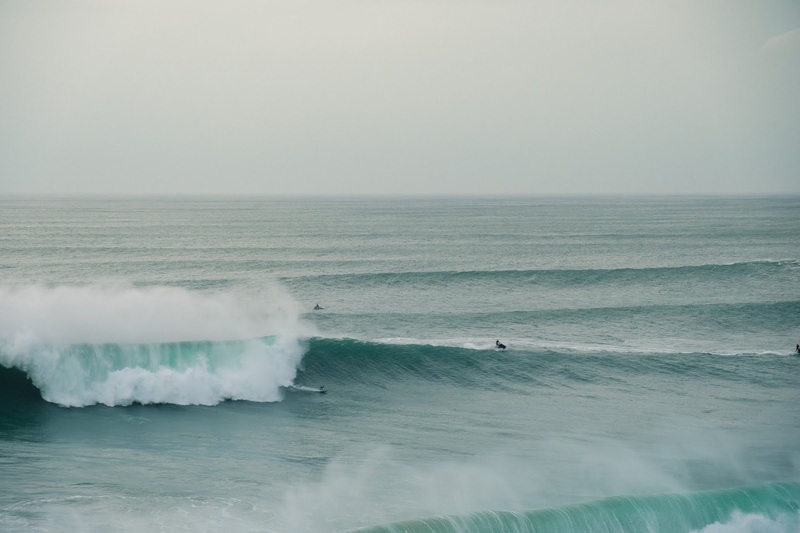 If you wish to book your trip to Portugal several months in advance, in addition to noting that you have to make your mark between October and February, you can always see news of the occurrence of giant waves in other years and try to match those dates, you can increase your probability of success but without ever being a guarantee of success. Do not forget, this is a phenomenon of nature and even a near forecast of the date may fail. We also strongly advise you to follow the Facebook pages of Praia do Norte Nazaré and the WSL Big Wave Awards, which publish in advance the alerts of the occurrence of giant waves in Nazaré. 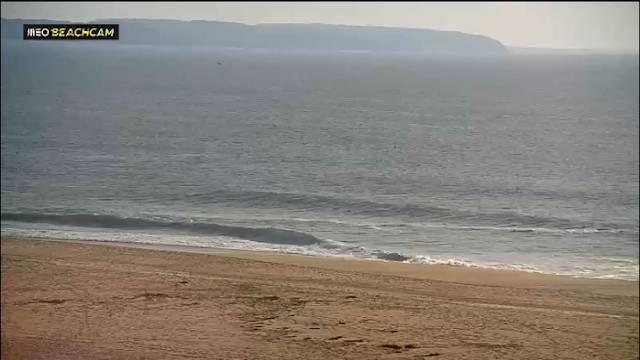 You can also see live the BeachCam of the North Beach (Praia do Norte) to see the state of the sea (just click on the names to follow to their facebook page or to the live cam). It can also help you understand the probability of occurrence of giant waves through the Windguru website, which allows you to see wave size forecasts up to 10 days in advance, as well as Surf's Website -Forecast.com (just click the names to access the websites). HOW TO GET TO THE NAZARÉ CANYON, ON NORTH BEACH? As mentioned before, the North beach (Praia do Norte) is right next to Nazaré Beach but, to get there, you will have to pass through the Sítio, the highest place od Nazaré, and we recommend you stop to watch the extraordinary view of Nazaré beach. 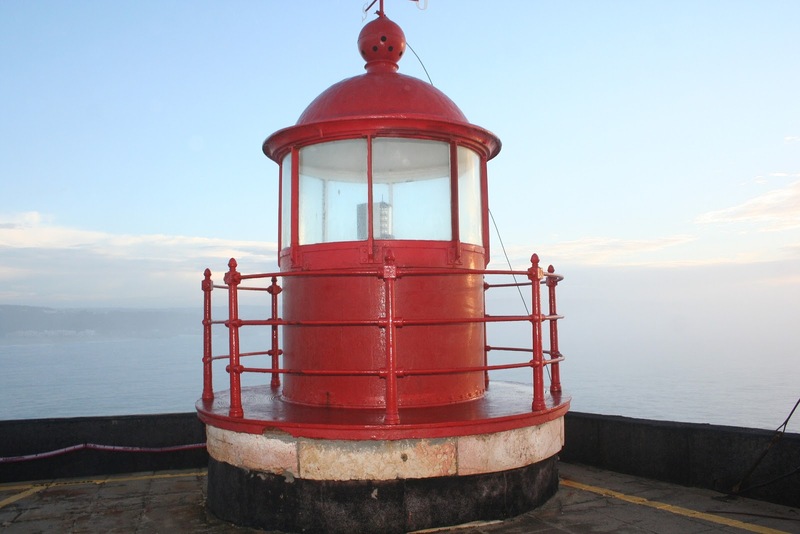 Then you can continue on foot or by car to the North Beach (Praia do Norte), but the best place to watch the Nazaré Canyon is next to the Fort of St. Michael the Archangel (Forte de São Miguel Arcanjo), where the Lighthouse is also. Parking may be conditioned on giant waves but the point will always be to leave the car a little further and do the rest of the journey on foot. For those who come by car, it is a quick trip from Lisbon, about 125 km and, even shorter for those coming from Coimbra, just over 110 km. For those who come from Porto, the distance is greater, about 220 km more, that are made on a trip of little more than 2 hours. If you come by bus, you also have the option of coming from Lisbon, Porto, and Coimbra. Click on the city name to find out more about prices and schedules. If you are staying in Lisbon, you can also do one-day organized tours that, in addition to taking you to Nazaré, can complement your day with other attractions in the West of Portugal, so it is worth doing research and see what else interest. 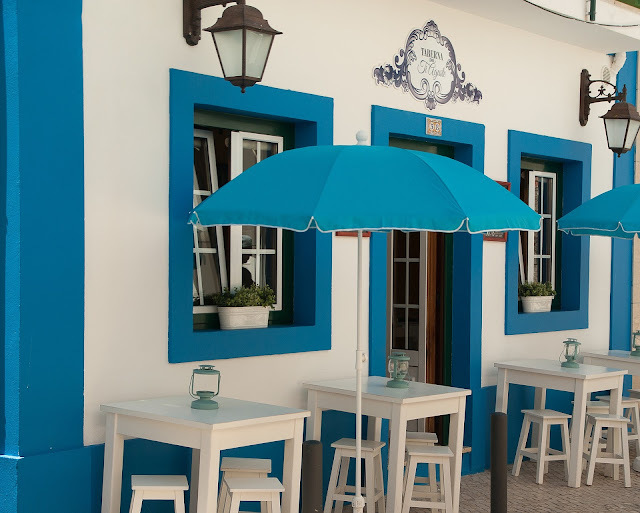 WHERE TO STAY IN NAZARÉ? As mentioned above, we are in the habit of spending holidays near Nazaré, near the beach of São Martinho do Porto, so we do not have much experience to stay in Nazaré. However, we can guarantee that it is the places in Portugal where it is easier to stay in Portugal and, more characteristic, we explain. Of course, there are hotels in Nazaré but, instead of giving us their opinion about them, we recommend that they use the old friend booking and try to see which options captivate them and, of course, consult prices and always fundamentally the opinion of who already been there. 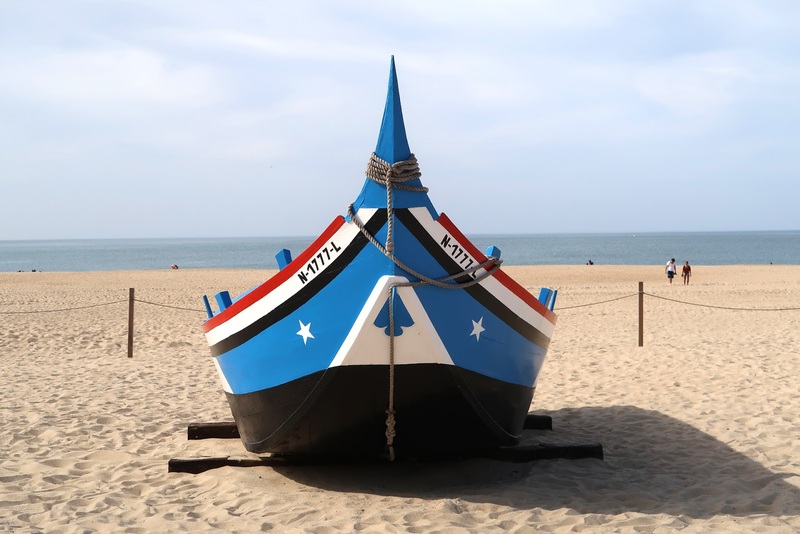 However, what we wanted to mention is something very characteristic of Nazaré, which are the women of fishermen, known for wearing their famous 7 skirts. Because we do not know if they are 7 skirts that use, but they wear a lot of skirts, they wear. And who are we talking about? Of the women of the fishermen who, some years ago had the idea of helping to pay the expenses of the house renting one or more of the rooms to the tourists who visited the city. 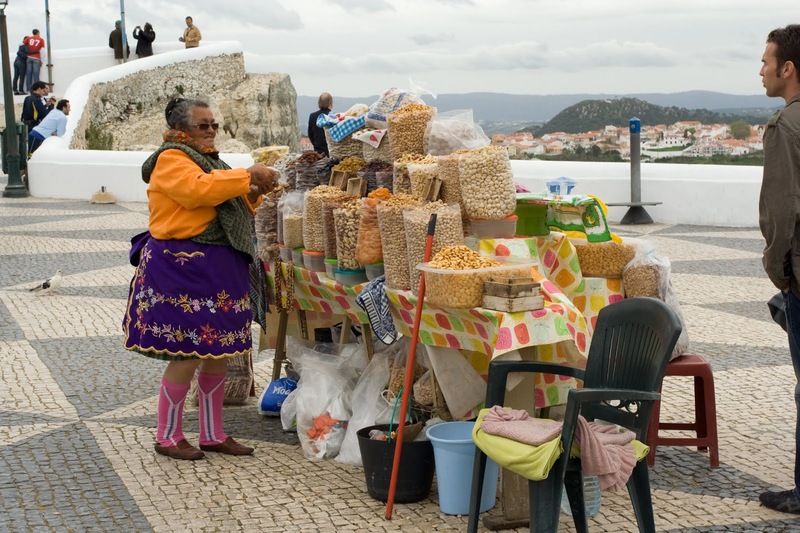 Well, the idea is on, and when you get to Nazaré, you will find dozens of women, with traditional skirts and a poster announcing the room rental. In fact, we can guarantee that it will be impossible to walk around Nazaré and not be asked several times if you want a room. The truth is that many of these women have already modernized and have their rooms advertised on sites such as Booking and Airbnb, but there is still the traditional collection of customers on the streets of the city, one of the unique characteristics of Nazaré and, we invite you to join us because we guarantee that you will be treated as if you were someone from the family. In addition to using digital platforms for the disclosure of your room, they are also registered and legalized, which always offers extra security to those who stay. WHAT TO DO IN NAZARÉ BEYOND SEEING THE NAZARÉ CANYON? Well, to conclude, and because Nazaré lives not only of waves, we give you some ideas about what you can do in Nazaré, besides seeing the Nazaré Canyon in Praia do Norte. One of the main attractions, of course, is the beach, if it is in summer, although the sea is a bit choppy, and the water tends to be cold, this is a beautiful beach with wonderful sand that invites you to enjoy it for hours. At the gastronomic level we are talking about a place of choice and, if it were not a fishing land, it is a perfect place to eat good fresh fish, which you can enjoy in the various restaurants that are located along the coast. Something that can not be missed when you go to Nazaré is to climb to the Sítio, where you can have the opportunity to watch a wonderful view of the Sunerco Viewpoint, which is 110 meters high above the sea. While on the Sítio, take the time to walk around the area and see the Church of Our Lady of Nazareth, the old Hospital and the Terreiro da Romaria. You can also visit the Dr. Joaquim Manso Ethnographic and Archaeological Museum, which is a great way to get to know the history of the village and its unique connection to the sea. You can know more information about the Museum, such as the timetables and prices through its website clicking here. 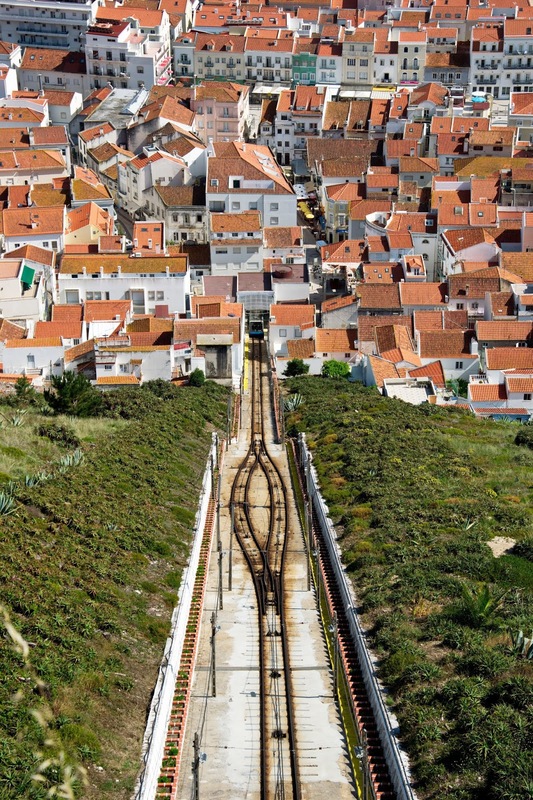 To get to the site coming from Nazare, you can do it on foot or by car but, what we recommend is to climb through the "Elevador da Nazaré", which since the end of the nineteenth century has helped to climb to the top those interested in visiting the Site, especially the pilgrims, because this has always been a place of pilgrimage over the years. The "Elevador da Nazaré" has always been one of the biggest reasons for the pride of the village, so we highly recommend that you talk your way to the top and enjoy the wonderful view. Of course, we have already talked about the Nazaré Canyon and the phenomenal stage you have to watch these fantastic giant waves. For this stage is the Fort of St. Michael the Archangel (Forte de São Miguel Arcanjo). 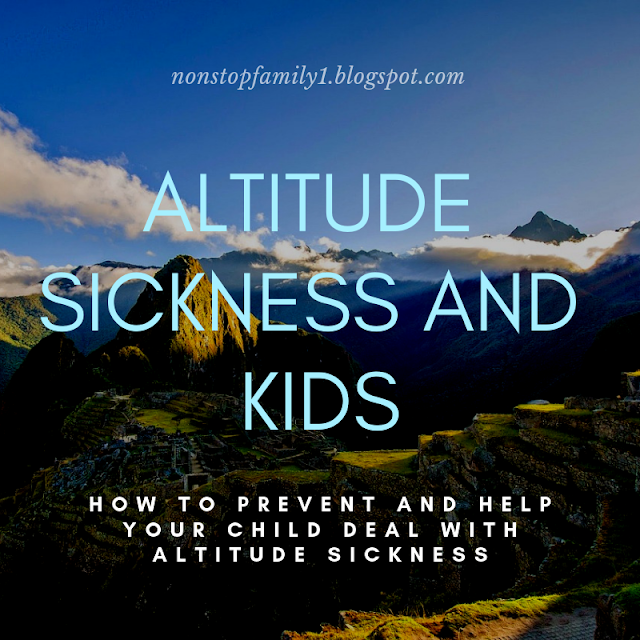 For those who travel with children, nothing better than saying that they will visit a fort that was made to defend the coast of pirates and, this story is true, because it was for that purpose. Fortunately it is no longer necessary to defend Portugal from pirates, however, this fort is located in a privileged place, on a slope that separates the beach of Nazaré from the North Beach (Praia do Norte) and, with magnificent views, even without being in the days of the giant waves, reason why is always worth the visit and is a short walk from the site. Finally, it becomes necessary to say a word about security. These waves are wonderful but, they are giant and, dangerous, the reason why it is necessary to really respect nature. Never venture to surf, few people have the capacity, have the necessary knowledge and the support to try to accomplish a task of this magnitude. And even in these circumstances, it is extremely dangerous. Even for those who are going to see, always respect the places marked to observe and, in no circumstance approach the sea more than the authorized, because the risk is enormous and when you see a wave more than 20 meters high, you will know the danger that we are talking about. Complying with the safety rules, prepare yourself, if you are lucky, you will attend one of the most wonderful spectacles that nature has to offer, you will never forget. We hope that our tips help you to plan your trip so that you can see the Nazaré Canyon. Do not forget to leave your comments, opinions, and questions, and if you liked this post, why not share it with your friends?